At Rhine Valley Game Calls we carry a selection of Bow Hunting Accesories needed for the Bow Hunter in the Family. These are just a few of the items that are in stock, as more are added on a regular basis. 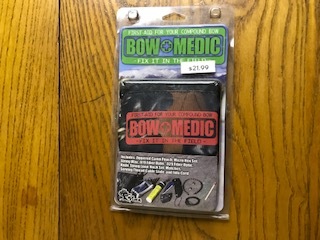 Western Adventures Bow Medic Kit. Pine Ridge Archer's Allen Wrench. Treestand Accessories Universal Bow Holder. Nocturnal Lighted Nocks for eith your Compound or Crossbow. Colors to Choose from are Red - Green - Blue with the exception of Crossbow which is only available in Red or Green.